In the music scene these days, finding a talented power-trio is a tough job. We just don’t find bands with guitar, bass and drums too often in the jam band market that wow audiences and climb the ladder of success. The Police, Cream, Rush, ZZ Top and Nirvana all had the right chemistry, were leaders of their time and only had three guys in the band. 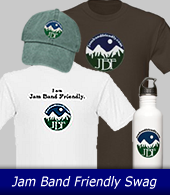 But now, deep in the heart of the Rocky Mountains, there’s a new band emerging and the guys with Interstate Stash Express think they can bring back that simple, rock-driven sound to concert goers who value great music. Interstate Stash Express is based out of Lyons, Colorado and has been playing together around the Midwest for several years. With a backbone in Rock, Blues, Jamband and Americana, the guys write clever songs, produce high-energy shows and want to make their mark in history as an accomplished power-trio. There is definitely room for this type of lineup in the jam band market and I think we could all use a few more in the community. The three-piece sound is simple, it’s clean and lets the musicians onstage stretch out and have more room to expand their ideas when performing. On guitar and vocals is Terry Kishiyama who is the driving force of the band. His vocal abilities have that dark and romantic sound like Eddie Vedder from Pearl Jam or Michael Glabicki from Rusted Root. Kishiyama doesn’t have any problem filling in the gaps with his guitar playing and his solos are creative and upbeat. On drums and the heart of the band is Tom McKee who has been playing with Kishiyama for many years. The long-time band mates met in Lincoln, Nebraska in 1998 and moved to Colorado together in search of better way of life. McKee has great chops and listens well. He hits hard and is powerful behind the drum kit. A year after living in Colorado, Kishiyama & McKee moved apart and McKee joined up with James Smith on bass . It was about 4 years later when McKee reunited with Kishiyama to form a new trio with Smith, whose bass playing is top-notch, big sounding and just the right touch to complete the rhythm section. Over the years, I.S.E. has recorded a few albums and EP’s, but their latest release Hurricane Window debuts this spring. I hear many influences in the recording and the production could easily fit into the alternative-rock, jam band genre. Songs are clever, well written and have a lot of meaning. For instance, Catch a Trout has that funky bounce to it and something you might here from The Big Wu. Kishiyama’s stellar guitar work shines from beginning to end on this one, with eloquent melody and catchy hooks. The song Mud also resonated well with me; maybe it has something to do with the jam band style and danceable sound. Funky drums and subtle bass lines carry the song behind the vocals out front. At almost 7 minutes in length, Mud is thick, layered well and is one of those feel-good, upbeat, love songs. Smith’s bass tone in this song is perfect for the arrangement and also drives hard. Gilley is a live track on the album that has a big 80’s rock sound with a modern jam-twist that would have any audience dancing along. Several minutes into the song, McGee launches into a drum solo that is complex, well skilled and lasts for at least 4 minutes. I am eager to see this band perform live on the west coast to check out their technique onstage. Improvisation is new to this group, but the guys are all eager to stretch out and take their audiences on a meandering journey. With a tour planned to the northwest sometime in the next year, anything is possible. The guys also want to focus in their hometown market, developing a loyal fan base before going national. I think I.S.E. has the right chemistry to attain longevity and growth in the coming years. Their booking agent, Jaime Taylor with Lovelightidea’s has faith too that these guys will take it to the next level. But, it’s possible that the music gods will be the judge of that when they decide the fate of this band. You can see the guys with I.S.E. perform at Desert Rocks this summer in Moab Utah which looks like it is shaping up to be a great festival. Kishiyama and I spoke on the phone recently about the history of the band and their new album Hurricane Window. I found Kishiyama to be easy going and extremely optimistic about the future; two character traits that are essential in the music business. With a little luck, the guys from I.S.E. might have what it takes to get to the next level and receive the national recognition that they are looking for. Congratulations on the new album, Hurricane Window. What was the process like for that, who worked on it and where was it recorded? Some of the album was recorded live and some was done in the studio, which we did at Far & Away Studios in Boulder. We found an amazing engineer named Geoff Grey and he comes from the old Avatar Recording Studio days. We walked into his place and were impressed at the guitars hanging on the wall, signed by Les Paul. We thought that we were in a different echelon the minute we set our eyes on the place. Jeff likes our music, which certainly helps with the recording process. A while ago, we played a gig in Dylan Colorado and the sound guy there was interning with Jeff at the time and thought we should meet him. He hooked it up for us. We did an EP last year called Stick which is all over the websites for download. A few months ago we went back to do another EP, but a few of us wanted more. We ended up pulling four live tracks from a show we did at The Dickens Opera House, which is 150 years old. Hurricane Window is an 8 track compilation including the 4 studio songs we did with Jeff. It is definitely not our debut album, but each time we get in the studio, we progress as a band. The first LP we did had 14 tracks and was made to get gigs. We did it in our own studio up on the Saint Vrain River near Lyons Colorado. It doubled as a guest house and we called it “the shack”. I hear a lot of Rusted Root, The Black Crowes and Guns & Roses in your sound. But, I am curious what everyone’s influences are in the band? Where do the three of you come from? The Guns & Roses come from my ‘teen angst’ years and they were one of the first shows I saw as a young adult in Denver. I am coming from a folk, country place, but Tom our drummer is more of a jam band guy focusing on the rock end of the spectrum. He has a hard time playing subtle stuff with brushes where you have to be really dynamic. James our bass player would win any rock and roll trivia out there. Right now I am listening to some Yardbirds from ’66 that he turned me onto. He is the most wide-open when it comes to influences and has a vast knowledge of music. What is the significance with the band name Interstate Stash Express? It comes from a model truck that was in a basement we played in, several years ago while doing an acoustic jam. We had a blast that night. We needed a name for the band and saw this bong case that my wife’s dad bought way back in the ‘70s. It is a green truck made out of clay with the name on the side, Interstate Stash Express. It’s in the shape of a box truck but the top lifts off and you can put your stash or tobacco in it. Then in the hood there is a pipe which goes all the way through to the exhaust hole. So it’s basically a big clay bong in the shape of a truck. It was a joke at the time, but the name just stuck. Take us back to the beginning Terry. I read online about starting in Nebraska and then moving to Colorado. What was going on when the band first got together? Tom and I met during a crazy storm in October of ’98 in Lincoln Nebraska. Tom lived in a big house near a country club and one night the power went out in town. His house wasn’t affected by the outages and a friend named Matt Loseke went over there to jam. The connection is that Matt and I had a band named Meandering Blue with Jyoti Kwankin, from India, on tablas. A friend of a friend recommended we go over to Tom’s house which had a drum kit. We jammed for a month or so and then did an open-stage which turned into a formal gig the following week. At the time, Tom was playing high school baseball and showed up in his outfit, complete with stirrup socks. We started as a trio and have remained that way ever since because we love the open space with only guitar, bass and drums. Knowing what’s possible helps with bands that have done it before and been successful like Cream, The Police, ZZ Top and the many trio’s that are doing it now. How is Colorado treating you? It must be a treat to be in the Rocky Mountain state with people who are passionate about music. How is it for you and the band? It’s really awesome and that’s the reason we packed up and moved out to Colorado. We were living in Nebraska and took a camping trip to Rocky Mountain National Park. On the way home we were killing time and drove by a town called Pinewood Springs. We stopped for a second to take a break, saw a house for rent and called the owner right there on the spot. Two weeks later we moved out there because it was less rent than we were paying in Lincoln and the surroundings were incredible. There are elk every morning in the backyard, which was a total culture shock. People in Lincoln weren’t getting the big picture of life and weren’t into the same music. Playing shows here, we go to Durango, Telluride, Steamboat and Breckenridge. Even if it’s a horrible gig, we say to ourselves, “look where we are at”. The song “So Weak So Strong”, what’s the story behind that? It’s a Gov’t Mule song, but we did a different take on the music which I wrote for it. We worked for an organization called “Casting for a Cure” and a friend of mine Ed Camerer who owns a cool music venue in Denver called The Highland Pacific turned me onto them. They are trying to find a cure for Rett Syndrome which only affects young girls. Bill the director who has a child with the disease runs the weekend with a fishing tournament in conjunction with the festival. I love to fly fish so it works out really well. At the opening gala Bill asked if we would play that song which is really important to him. I couldn’t really learn the song the way Warren and the guys play it. He plays it with a 12-string, way up on the neck and the song has a very technical approach. The night before the show, I threw together a simple progression using the same lyrics. Everyone loved it and we ended up recording the song for a benefit CD. I just didn’t have the time to master the cover tune for them, so it all worked out. I’ve noticed the band stretching out onstage in the recordings and playing songs that are more than 8 minutes long. What does the band like more, the short punchy songs or ones that have open ended jams built in? We are learning each show how to do that going into improvisational sections. Depending on the venue, I think the longer we play together, the more people want to hear songs. At least in the first set we should do that, but it’s kind of random. You have to vibe off the crowd and try to judge what the people want. Usually, we will play a few songs and if the response isn’t that good, we will play a blues tune. Then we will really rock one which turns our drummer on. We haven’t really mastered that improvisational aspect yet. You are playing Desert Rocks in Moab Utah in a couple of months. What are your plans for the late Spring & Summer and the next 6 months? We’ve come to the conclusion that our fan base is our top priority right now. We are going to stick around Colorado and focus on the immediate area. We want to build a local following and a solid home base before we hit the road. First a band should conquer its town and then begin to branch out nationally. We aren’t in a big rush and timing is everything. We are still in the learning process, but looking to book a tour around the Northwest doing Montana, Oregon and British Columbia. Our booking agent Jaime Taylor is working on something in New England as well and all of us are itching to get out there. What kind of band do you want to be? Would you all be happy doing 150 shows a year, living the life of a full-time musician and working with other bands? Is that the plan? Yes, definitely. We have talked about it a lot, but we are already doing 70 shows a year right now. A 30-day run would be so exciting for us but we all have families. I would love to take my son with us on tour and make it a family thing. There are thousands of bands out there all vying for a place in history. Do you think there is a higher power that determines which bands make and excel to the next level? What is it that propels a band to stardom besides luck and great chops? For me, one night could do a huge thing for the band. There is certainly more to it, but we played in Steamboat recently and JoJo Hermann from Widespread Panic was there. He played a big show with his Mardi Gras band and was there for the night. Half way through the first set, someone put a note at my feet that he was there and interested in playing with us. We all got energized to put on a great performance, but we didn’t have a keyboard handy for him to sit in. I think it takes some luck, but he might remember us and we might meet up sometime. We can’t do it alone and working with other bands is definitely important. We haven’t had that exposure yet. The whole Facebook, viral connection is so crucial right now. Terry, what audience do you think is going to like your music? I think it will be somewhere in the Tom Petty meets Grateful Dead audience. Not that we are pop oriented, but we sometimes get noticed for a jam band while at the same time a rock band as well. I think the power-trio summary fits well. If you go to a Pearl Jam show, that type of audience might be us. We definitely don’t have a personality yet. At some of the shows, there might be some good old cowboys, but then again there might be younger jam oriented fans who want to rock. It is certainly a treat to see a power-trio out there because that lineup is few and far between in the jam scene. Do you talk about the idea of having someone else join the band? We have talked about it and had guys sit in but never took it to the next level. It would change it immensely and even when we record I have to think about the dynamics of it. Keys would be great, and we are not known for a singing band but if someone came along, we would entertain the idea of having more vocals. Have you thought about where you want to be in 10 years? Yes, I have and consider music my life work. It may be different, but I will always be playing music. We will never be a radio band because we are not pop and now radio has changed in the modern age. Around here there is a lot of Americana and bluegrass. I would love life if it were totally different. I don’t want to play the same songs for 10 or 20 years. There is an unlimited supply of inspiration out there to inspire songs. I also play in a duo with my buddy Ash Ganley and my playing gets better when I jam with him. In my opinion, he is the best song writer in Colorado. The three of you have great chemistry. You all have amazing chops and great songwriting abilities, which says a lot. We wish you a lot of luck this year, have a great time at Desert Rocks.